A unique, interest-free monthly payment model for your TOUGHBOOK solutions. And because TOUGHBOOK-as-a-Service is subscription-based, your organisation will benefit from the OPEX way of doing business. So, it’s better for your balance sheet. What can your organisation look forward to? With 0% interest* you pay the same as a cash purchase, but with the exceptional benefit of spreading your payments over the long term. Your budget goes further. So you can allocate it to other resources. Should you want to own your assets at the end of your contract, Econocom - our TOUGHBOOK-as-a-Service finance partner - can accommodate that too. No more outdated tech means no more unexpected maintenance and downtime costs. Not to mention increased day-to-day operational savings. Upgrade your tech more regularly to always have the best equipment and stay ahead of the competition. 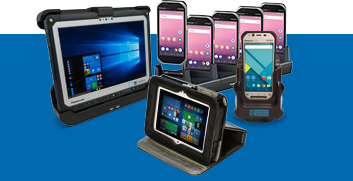 Thanks to TOUGHBOOK-as-a-Service, your workforce will be equipped with the latest (and best) rugged devices, software and services. All for low monthly costs. Subscription-based TOUGHBOOK-as-a-Service means you benefit from an OPEX-based model. So it’s better for your balance sheet. TOUGHBOOK-as-a-Service doesn’t just apply to our rugged devices. Other items and services (soft costs) can easily be added into your monthly 0% interest payments too. Discover how your organisation could benefit from the latest rugged technology, entirely personalised to your needs, without the painful up-front payments. Contact the TOUGHBOOK-as-a-Service team today at ProServices@eu.panasonic.com. * TOUGHBOOK-as-a-Service is a 0% finance OPEX solution, including up to 20% soft costs. If the transaction involves more than 20% soft costs / software, the interest rate over 3 years will not be 0%. For example, if you include 40% soft costs, the interest rate will be circa 1.05%. Please contact us for a quotation.